Making sure that 435 elected officials follow rules of order may sound like a task akin to herding cats, but one Hawkeye is up to the challenge. 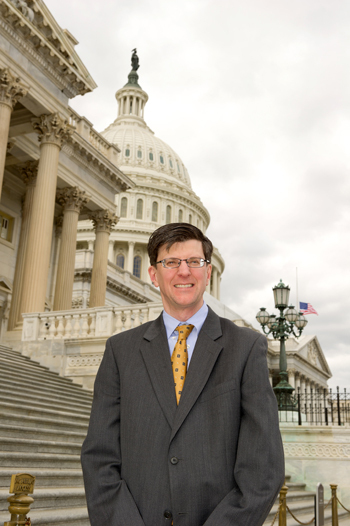 This past March, Tom Wickham, 90BA, 94JD, became parliamentarian of the U.S. House of Representatives, a nonpartisan post appointed by the Speaker of the House. Seated to the right of the speaker when Congress is in session, the parliamentarian advises the presiding officers and lawmakers on procedural rules established by the U.S. Constitution and through precedent. Throughout the year, he also responds to legislative inquiries from committees working on bills. "There are 435 members of the U.S. House, each with different constituencies and different goals. Our office—with six attorneys and three clerks—is dedicated to making sure that proper procedures are followed," Wickham explains. "We help to make sure that the debate follows a certain order and does not descend into chaos." One of the parliamentarian's biggest challenges is to maintain neutrality—and, in turn, the trust of the representatives. Wickham is only the fifth person to serve in the position since 1927 (though similar roles date back to 1857). He has worked in the office for 17 years, starting in 1995 as an assistant parliamentarian and becoming deputy parliamentarian in 2005. He has served under four Speakers of the House. Wickham jokes that growing up as the fifth of eight children gave him an advantage in his work ("Oftentimes, I had to be the referee between my older and younger siblings," he says). But he also credits his time at the University of Iowa for setting his career path. He particularly appreciates his undergraduate studies in the political science department, as well as the honors program that served as a good launching pad to law school. Also invaluable was his participation in the UI's Washington Center Internship Program, through which he spent a summer earning academic credit in Washington, D.C. He continues to work with the center to share his experiences with current interns. Although at times Wickham misses advocacy, the work of the House parliamentarian is varied and stimulating. "Tom Wickham, in addition to being a master of the House's rules and traditions, has the sound judgment and steady temperament required to serve as parliamentarian," says Speaker of the House John Boehner. "Tom has earned the respect of lawmakers and staff on both sides of the aisle, and I have every confidence in him." "We might address 20 different subjects in a day, from the technical aspects of defense policy to a women's health issue," says Wickham, whose office also is responsible for compiling and publishing House rules and precedent. "I really enjoy working in this institution. I get to see the workings of government from a unique perspective." In fact, Wickham challenges those who have become disillusioned with Congress to visit the nation's capital. "Coming here will raise the spirits of anyone who has lost faith in the process," he says. "I get to work with my counterparts in other countries, and I see what a leader the U.S. is around the globe. Many countries use our system as a model, and that's an inspiration."